If you've ever wondered what the Australian actor would look like without a face, here's your chance to find out. The first official image of Hugo Weaving as Captain America's arch nemesis, the Red Skull, has arrived on the internet, and he looks terrifying and dapper in equal measures. Weaving is sporting a black leather number for the movie, topped with - unsurprisingly - a reddish, skull-like motif. It's not the first time we've seen Weaving in the Red Skull make up - he recently popped up for a few frames in the first trailer for the movie - but this is not only clearer, it also includes his uniform. Sharp-eyed comic book fans will recognize the symbol on his belt as the emblem of HYDRA, a terrorist organization that many high-profile Marvel villains have been members of over the years. The movie version of the character is a little different than he was in the comics. 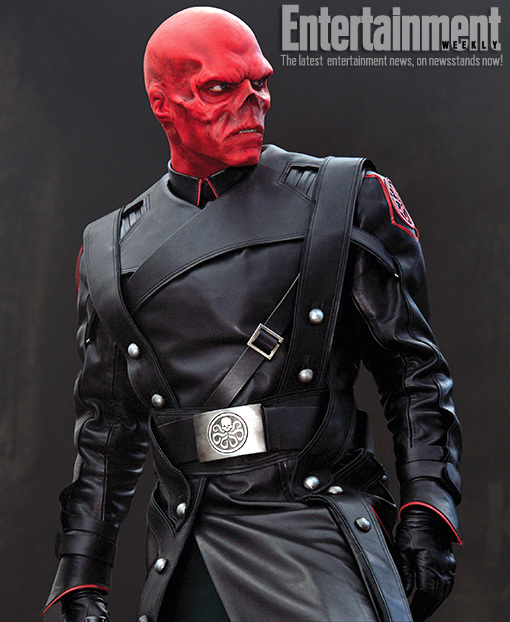 In the comics, the Red Skull - whose real name is Johann Schmidt - wore a skull mask over a regular face, whereas the movie version wears the mask of a regular face over his hideous real face. In the movie, Schmidt's face is the result of him taking a similar super-serum to the one used to make Captain America what he is. The serum changes the person based on who they are inside, so while Captain America became a hero, Schmidt became a monster. Weaving looks amazing in the costume, and after his performance as Agent Smith in the Matrix movies, where he was arguably the best thing the trilogy had going, it's clear that he has a flair for villains. Regardless of what the rest of the movie is like, he's almost certainly going to be a joy to watch, and for some people - myself included - he's going to be one of the top reasons to go see the film. Captain America: First Avenger hits theaters on July 22nd.